Orange Cream Mini Paleo Upside Down Cake! 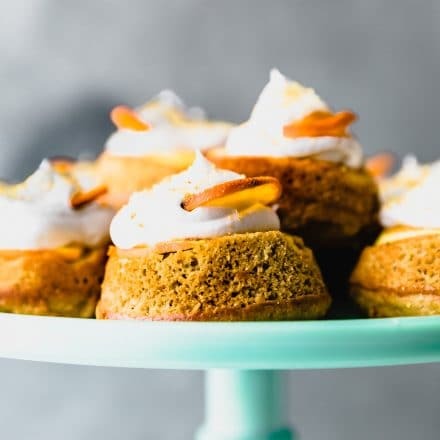 Topped with fluffy whipped coconut cream frosting and orange zest, they are healthy, light, and refreshing. Preheat oven to 350F. If you are using coconut cream, be sure it has chilled 24 Hrs. Or see notes for quick version. Place dry ingredients in a large bowl and mix until combined. Set aside. In another bowl, beat your eggs, juice, almond butter, banana, coconut sugar, and extracts in another bowl for about 1-2 minutes, until creamy. You can do this with a stand mixer or hand held mixer. Add your dry ingredients to the wet egg banana batter. Mix again until smooth. Grease the bottom of a muffin pan. Place thinly sliced orange slices at the bottom of a large muffin pan, pour the batter on top of each, filling to 2/3 full. Max 3/4 full. Place in oven for 15-16 minutes. Check to see if muffins are cooked with tooth pick. It should come out clean if they are done. Let cool completely. While cooling, make your orange cream coconut whip. While muffins are cooling, you can also make your broiled orange topping. quarter a small orange or mandarain. slice thin so that you have 10-12 strips. Place on baking sheet with parchmenet paper. Sprinkle coconut sugar on top. Place oven on broil. Slice/quarter oranges or tangerines and toss with a little melted coconut oil or butter. Just a tsp or so. Place extra orange or mandarin slices on parchment paper or greased baking sheet and broil orange slices for 3-5 minutes or until orange slices are slightly browned. Remove and set aside. Once muffins have cooled, remove and flip them over. You will then want to cut off the TOP PART of the muffin, creating an even bottom. Think of it a s mini upside-down cake. Place muffins on cake stand or large plate, with the bottom of the muffin up (it should have the orange cooked on top). With a spoon, or pipping bag, spoon 2 tbsp of whipped coconut cream top of each cake. right above the orange slice that was cooked with it. Place the broiled orange slice on top. Drizzle with orange zest and a touch of honey if desired. Repeat for all upside down muffin/cakes. Keeps well in fridge for up to 3-5 days. Keep in fridge before serving. If you are using coconut cream, be sure to chill it first for 24 hours. Here’s my coconut frosting recipe to refer to. If you are short on time, you can use any whipped topping of choice! It’s all delicious. I love this vegan whip. Not paleo? Heavy whipping cream works well too.